I mentioned a week or two ago that I’d received several really good emails of late that I would be sharing. 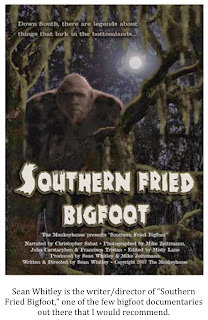 Can't recall if we ever met in person or not, but if not, I'm Sean, the director of "Southern Fried Bigfoot. "I saw your posting about black panther sightings and though I'd share the following. Between the summer of 1980 and the spring of 1981, my family lived in the town of Porter, which is about 40-60 miles northeast of Houston if memory serves me correctly. It was fairly wooded, and the relatively new housing development we lived in was surrounded by woods. The neighborhood built a small playground for the kids and when we all started to ask if they'd ever put in a pool, I can remember one kid mentioning that his father said no because "panthers would pee in it." In the early 1980s, I used to go fishing with my late grandfather in various parts of East Texas. I can recall him mentioning black panthers either around the Sabine River bottoms and areas near Lake Tawakoni. I never found out if he'd ever seen one, but he talked as if he knew they were there. A few years back, I was involved in a potential TV project and got Chester Moore, Jr. involved. Unfortunately the network passed after the sizzle reel was completed. However, we both heard some incredible stories from folks who claimed to have had first-hand encounters. A vet near Tyler told us she saw a large black panther cross her path on a rural road one night. Just east of Tyler, two homeowners in a rural area told us how they came upon a black panther trying to attack goats held in a pen on their property. Their approaching car lights scared it off, and the next day, they took photos of paw prints they found. Finally, some fishermen at a bait shop on Caddo Lake told us they've heard screams in the woods that they knew came from panthers. I've got a college friend whose father owns hundreds of acres of private land near Mount Pleasant. In fact, we used his ranch as a location for the suit shots in "SFB" since we needed a safe place where our ape-suited actors wouldn't get shot at by passing hunters. While my friend's dad didn't see a black panther, he claimed he and his wife saw a mountain lion on the property on two different occasions. The wife saw it first as it bounded across one of their pastures one day, and my friend's dad scoffed. However, he saw it himself the next day. The interesting thing is that this man is a big game hunter who's hunted in Alaska and Africa. He's got stuffed bears, wolves, and antelope in his home. He knows the difference between a bobcat and a mountain lion. He also told me there had been attacks on livestock in areas near his home that sound like big cat attacks. Anyway, thought I'd share. Keep up the good work with the blog. Sean’s experiences talking about this subject with the people of East Texas mirror my own experiences and firm up my belief that there is an actual biological basis that explains sightings of large, black, long-tailed cats in Texas and across the South. Sean’s discussion with his college friend’s Dad in which the gentleman discusses seeing a mountain lion also supports my believe that these cats have made a big comeback in the eastern portion of the state. Keep your eyes open, folks. Have your cameras with you when you are out and about. If you have the means, I’d recommend strapping on a GoPro so you don’t even have to think about snapping a photo. If these cats are out there, and I truly believe they are, then it is only a matter of time before a legitimate photo surfaces. Let’s see if we can speed up the process. Where Have You Gone, Texas Cryptid Hunter? When I wrote the title to this post I had the tune from Simon & Garfunkle's "Mrs. Robinson" going through my head. I don't think it quite worked as well as I would have liked but no matter. Onward. I know that a few of you out there have noticed that I’ve been less active on the blog over the last year or so. I’ve received multiple emails over this time period wanting to know if everything was all right and if I planned to keep the site up and going. The answer is yes, everything is ok and I do plan on keeping the blog up and going. It is true that I’ve been less active over this past year but there is a reason for it. Multiple reasons contributed to my posting less often but the biggest of them is a project I’ve been working very hard on for about two and a half years now; a project that I’ve mentioned in passing from time to time on Facebook, Twitter and the blog. I’ve been writing a book. To be specific, I’ve been writing a children’s book. The idea for the story first came to me almost a decade ago. As the years passed, I refined the idea, added to it, took things away and basically went through about fifty drafts in my head without ever writing anything down. Finally, I had what I thought was a pretty unique tale; one that combined real life events with a separate fictional story line. I remember thinking to myself, “Somebody ought to do that (write it).” Then one day, I simply forgot about it. I’m guessing that roughly three years passed where I didn’t think about the story at all. Then one day, something jogged my memory and brought the story rushing back to me. I do not recall what the trigger was but am grateful for it. I decided then and there that I needed to write it all down so that I wouldn’t lose it forever. So, that is what I did. I sat down one summer day and knocked the whole thing out in less than two hours. It didn’t take long as I had been through all those mental revisions years before and had, in my mind, a satisfying story all laid out. Satisfied, I saved the story and went to watch television. I hadn’t been watching too long when a familiar, if slightly revised, thought returned to me. I decided then to try and make this book a reality. To do that, I needed an illustrator. I contacted Robert Swain, author and illustrator of the Laughsquatch cartoons, to see if he would be interested in the project. To my everlasting gratitude, Robert agreed to do the illustrations for the story. I sent him the text to the story and a crude idea for a layout where I described what I envisioned would be on each page and what I would like to see in the accompanying illustration. Robert took my thoughts, added to and improved upon them, and came up with a series of brilliant illustrations that rival anything out there as far as quality. We also collaborated on a very unique aspect of the book that I am very excited about and will describe in more detail at a later date. It took the better part of two years to get all of the illustrations complete but they were absolutely worth waiting for and I can’t wait for everyone to see them. Robert and I now had a mock-up of the book with the text embedded in the illustrations. I was very excited and just knew that some publishing house would be falling all over itself to publish this book. Boy, was I naïve. Practically no publishers accept unsolicited manuscripts. Most only accept manuscripts sent in by literary agents. “Ok,” I thought. “I’ll get an agent.” Again, I had no idea what I was getting into. I found a lot of literary agencies out there but very few accept non-referred clients. Of those that do, most only accept 2-3 new authors a year. I spent months submitting my story to agents without success. Most of the time, these agencies want you to submit your work to them on an exclusive basis and then take 6-12 weeks to get back to you (likely with a rejection). Some simply state that if you haven’t heard back from them within 3 months, they have passed on your manuscript. It was all very educational… and frustrating. Some of the agents were very nice. I had three basically tell me the same thing. The story and illustrations were of high enough quality but the subject matter was likely too “niche” to guarantee a high volume of sales. It seems the publishing world is a bit conservative when it comes to taking a chance on someone new or something a bit unconventional. Robert and I discussed it and decided we would just publish the book ourselves. Self-publishing has sort of a mixed reputation depending on whom you talk to but we have worked very hard to ensure that we have a professional-looking and polished final product. I am excited to report that the final edits have been made (finally) and the book is going to press this week. I expect the book to be available for purchase within the next 2-3 weeks. The book will be available in conventional format and electronic formats (think Kindles, iPads and other e-book readers) through Amazon, Barnes & Noble and other outlets. Again, I’ll let you in on more details as the release date approaches. So, now you know where I’ve been and what I’ve been up to. I’ve been anything but idle. Now that this project is wrapping up, I’ll have more time to see what else I can get into, haha. More soon. My best to you all. I’ve heard 3-4 reports of an odd animal being sighted in the Copperas Cove/Kempner area over the last six months. The animal in question has been described to me as looking similar to a jackrabbit but… "different.” Another alleged witness described the creature she saw as looking like a small kangaroo. I was intrigued but with no photos to go on and only the most general idea of where the animal might be lurking, there wasn’t much I could do. Predictably, as more sightings were reported, rumors ranging from the humorous (jackalope) to the fantastic (chupacabras) began to make the rounds. Whatever this mystery animal was, clearly it was something with which most people were not familiar. Most stories of this sort never come to any sort of definitive conclusion. There is a flap of sightings and then they stop. People are left to wonder exactly what was going on. Fortunately, this time, that is not the case. It appears the identity of the mystery animal of Coryell County has been discovered. The animal in question? 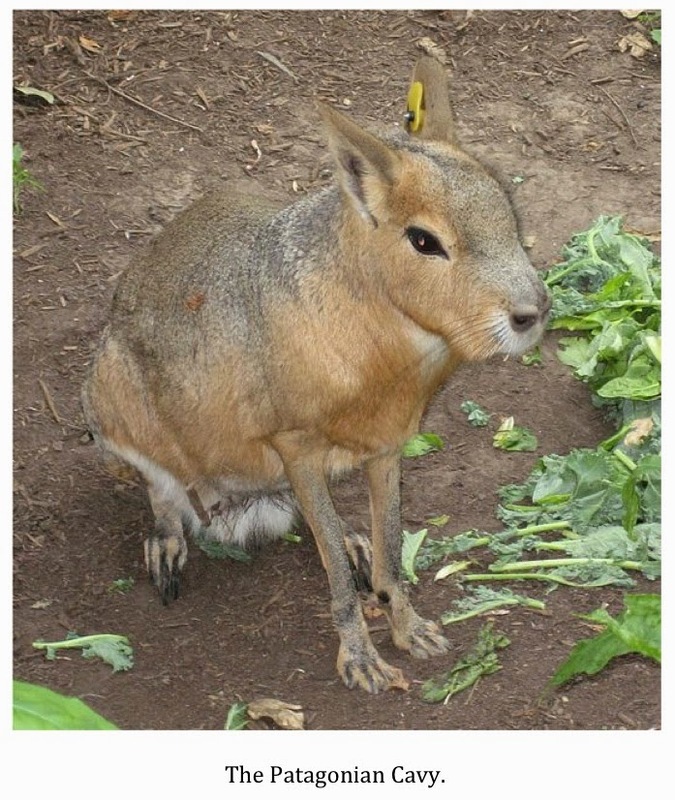 A Patagonian Cavy. According to a story in this past Sunday’s Temple Daily Telegram, the cavy was captured in late October by a Copperas Cove resident who then turned the out of place rodent over to Mike and Amanda Vaughn who own a pet shot in the area. Vaughn said he received a call from a local who thought she had captured a wallaby. When Vaughn went out to investigate, he discovered she had actually captured a cavy. 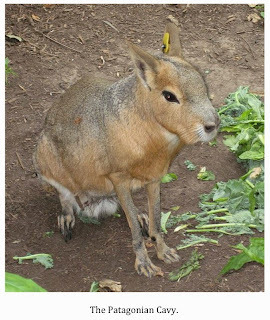 The Patagonian Cavy (Dolichotis patagonum) is native to the Patagonian Steppes of Argentina. They are relatives of the common guinea pig and the more well-known capybara. They are classified as near threatened. Hunting, the animals are killed for their meat and skins, and the introduction of domestic sheep within their habitat are the two main factors in the shrinking number of cavies in the wild. The animals gained popularity as exotic pets after being featured on an episode of Sir David Attenborough’s “The Trials of Life.” It was, however, quickly found that these large rodents make poor pets. They tend to panic around people and crash about. Injuries to themselves and owners are common. In addition, most vets have no idea how to treat one of these creatures and their dietary needs are difficult to manage. Many owners quickly gave up on the idea of having a cavy as a pet. As so often happens, irresponsible owners began to turn these creatures loose. I have no doubt that some of the sightings of chupacabras and kangaroos around the country were actually of cavies. The famous “Tulsa Kangaroo Incident” falls into this category. How this particular cavy wound up in Copperas Cove is still up for speculation. When captured, it had a large boil behind its shoulder blades. When the Vaughns treated the boil they discovered a 4-inch tranquilizer dart embedded in the animal’s flesh. The Vaughns removed the needle and treated the infected area. The cavy, named Pepper, seems to be doing fine now and the Vaughns are seeking a permanent home for her. Just who would be shooting a tranquilizer dart at a South American rodent in Eastern Coryell County is a story I’d like to unravel. I guess chupacabras fans will be disappointed to learn that the infamous goat-sucker is not responsible for the rash of strange sightings over the last few months. I don’t fall into that group. 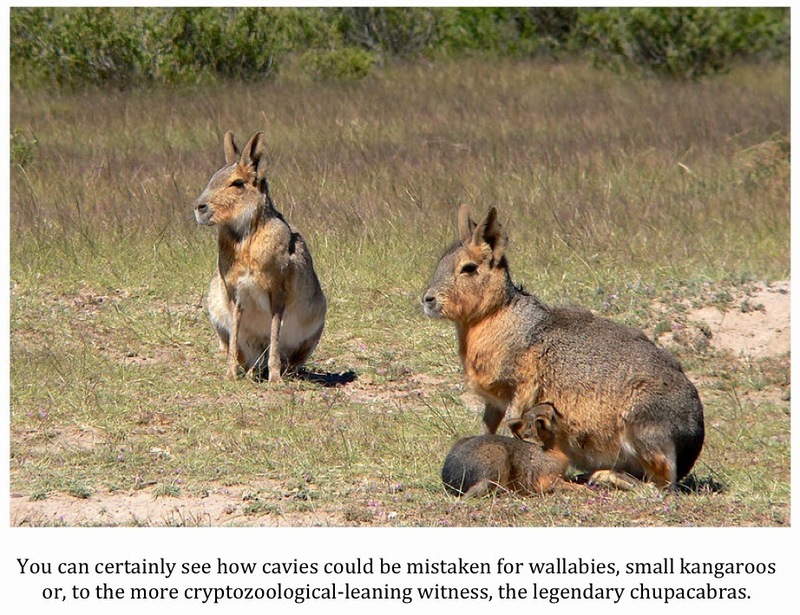 While the Patagonian Cavy doesn’t qualify as a cryptid in the strictest sense, it is inarguable that it is an out of place animal and the whole incident makes for a very entertaining story. County and wildlife officials, might want to remind themselves that there actually was a real flesh and blood animal behind the strange sightings being reported. Maybe it wasn’t the mysterious animal many assumed but it was a real animal, nonetheless. Hopefully, they will recall the strange case of the Copperas Cove Cavy the next time someone reports something that seems too weird or fantastic to be true. If they do, there is just no telling what they might find. As I mentioned, I have received a couple of good emails/comments but I’m going to do separate posts on each. Here is the first communication. It came in the form of a comment to a post I did on an alleged wood ape sighting in SE Texas. First, the reader expresses his thoughts on the alleged wood ape sighting in Port Neches, TX (read posts on that sighting here and here) and then transitions to a discussion on black panthers. 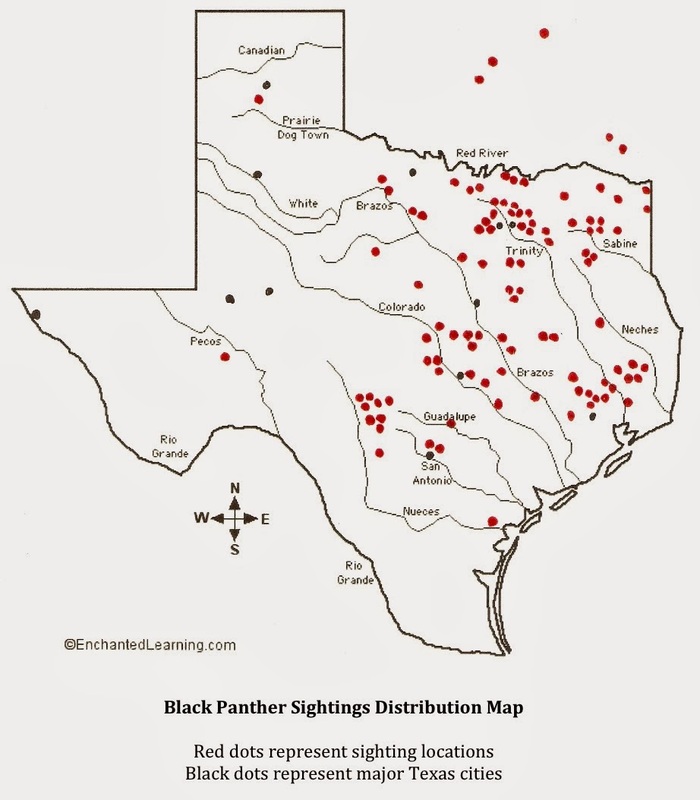 The enigmatic black panther phenomenon is alive and well in Texas (as well as other states). Wildlife officials almost universally say there is no such animal. They will tell you that there has never been a documented case of a melanistic mountain lion and that jaguars have been extirpated from North America with the only possible exceptions being extreme South Texas, New Mexico and Arizona. The facts they quote are just that…facts. It is true there have been no documented cases of melanism in a North American cougar. It is also true that jaguars are extremely rare North of the Rio Grande. Still, witnesses continue to come forward claiming sightings of these ghost cats. What are we to make of this? First, let me repeat something that I’ve said before. I know that there is no such animal as a “black panther.” The known big cats that have been given this moniker are either African leopards or New World jaguars exhibiting melanism. 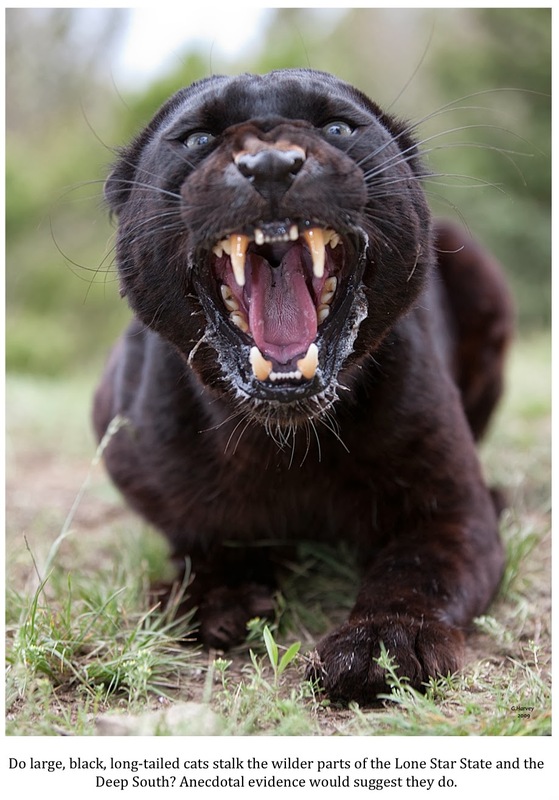 So, when I use the term “black panther” realize it is a colloquialism, a catchall phrase, if you will, that is commonly used in Texas and the Deep South to describe any large, black or very dark, long-tailed cat. Now that is out of the way, I present to you the latest sighting reports that have come in to me from people claiming to have seen these enigmatic animals. As always, I cannot vouch for the veracity of these accounts. Most of them have come in as comments to blog posts with the commenter remaining anonymous. That being the case, I can’t make secondary contact. It is possible that some sighting reports are the work of hoaxers but I have diligently weeded out those that seem “shady” and printed only those that seem reasonable and credible. The original reports are in italics and are followed by my comments. TCH Comment – This report originates in Kentucky but I’ve included it here to help illustrate that sightings of large black cats are not just a Texas phenomenon. These animals are reported through out the South on a fairly regular basis. While reports from farther North are less common, they do occur, as the next report will illustrate. 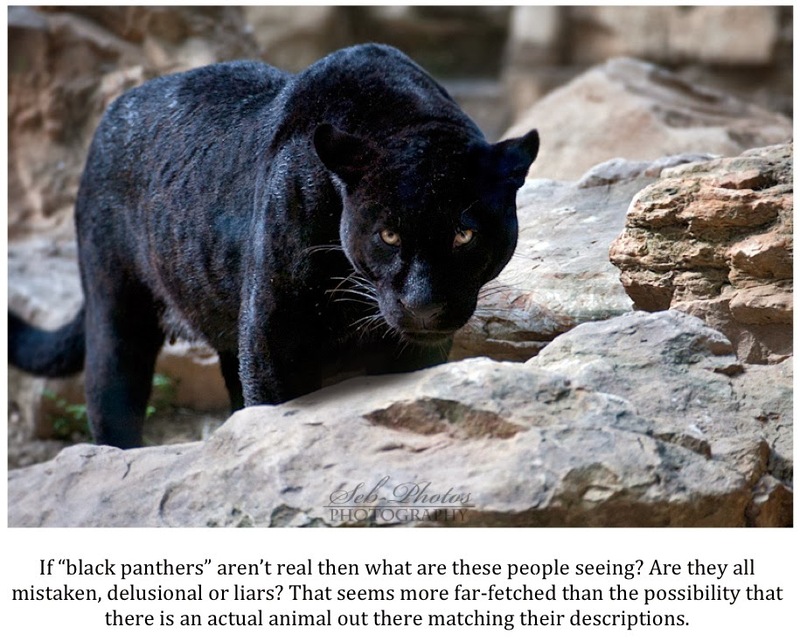 TCH Comment – Another report included to show that “black panthers” are not strictly a Texas or Deep South phenomenon. The reaction this witness received from the authorities is, unfortunately, the norm. 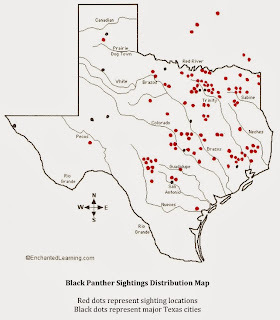 TCH Comment – A look at my black panther distribution map shows that Wise County and the surrounding area is a hot spot for sightings of large black cats. This sighting fits the “headwaters pattern” discussed in previous posts as it takes place very near the West fork of the Trinity River. The Lyndon B. Johnson National Grassland is also located in Wise County. It provides in excess of 20,300 acres of remote wilderness where a large cat could reside. TCH Comment – Mountain lion sightings near Lake LBJ, while not common, are not unheard of. The reservoir sits 45 miles Northwest of Austin and forms part of the border between Llano and Burnet Counties. I’ve received several reports from this part of Central Texas (see distribution map). TCH Comment – This area of the Brazos Valley, surprisingly to me, hasn’t had too many sightings of large, black, long-tailed cats. The area does sit directly between two areas, Central Texas and Southeast Texas, that do have high concentrations of sightings. Maybe the Brazos River is a travel corridor for these cats? One thing I found intriguing were the sounds the reader attributes to these cats. The “woman-like” scream is something that has been reported many, many times; however, her reference to a “roar” is unusual. Mountain lions are not considered true big cats by wildlife biologists. There are several reasons for this but one of them is the fact that, unlike tigers and lions, cougars cannot roar. IF the roaring sound the reader refers to is, indeed, coming from a big cat, it isn’t a mountain lion she is seeing. On the other hand, jaguars, which are historically native to Texas, can and do roar. As most know, jaguars can be melanistic as well. Could a jaguar have made its way as far North as the Brazos Valley? TCH Comment – Another report originating near the headwaters of the Trinity River. This reader echoes what many witnesses have told me; mainly, that the long-tailed black cat they saw was too big to have been a jaguarundi. Many others pointed out that the small odd-shaped head of the jaguarundi does not match the shape or size of the head of the cat they saw. TCH Comment – Still another report from Wise County. Could a hard pattern be developing here? If this witness is reading this post, I would really love to see that picture your managed to snap of the cat. Please contact me via email at Texascryptidhunter@yahoo.com. TCH Comment – This report comes from much closer to home for me. Lingleville is an unincorporated community in Erath County. This area is very rural and dominated by ranches and dairy farms though it is also home to two of the nation’s largest renewable natural gas plants. Again, the “headwaters” theory comes into play as the North Bosque and Leon Rivers spring to life here. Lots of reports of mountain lions and “black panthers” come from this area. TCH Comment – The photograph Mr. Crawford refers to is below. 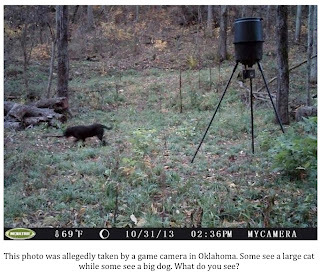 The photo was allegedly taken by a game camera in SE Oklahoma and shows what seems like a Labrador-sized, black animal with a long tail. Speculation as to the authenticity of the photo has raged since it was made public. Some see a large black cat, some a black dog. Some claim to see signs of digital manipulation. TCH Comment – Atlanta sits in Cass County in the extreme NE corner of the Lone Star State. This is deep in the Piney Woods region of the Ark-LA-TX area. People living in the more rural areas and river bottoms simply accept the reality of “black panthers.” Many do not realize that such an animal is not supposed to exist. This particular report mentions a cat that is “brown in color.” It is possible this was a darker than usual mountain lion, I suppose. Still, this gentleman speaks like a seasoned hunter and I would guess he would be able to identify a cougar even if he had never seen one in the wild before. Curious. TCH Comment – Kaufman County sits in NE Texas near the upper reaches of the Trinity and Neches Rivers. The sightings from this general area continue to accumulate. I, too, wish this reader had taken a photo back in 1984. TCH Comment – Hooks sits in Bowie County, the most Northeastern county in Texas. This is a surprisingly wild and lightly populated area that is heavily wooded and has many rivers, creeks, bayous and swamps (it is just a stone’s throw from Miller County, Arkansas which is home to the famous Fouke Monster). “Black panthers” are just part of the lore from this area. Like other rural areas of the state, longtime residents have no doubts these large black cats are real. As far as they are concerned, these animals have always been there. TCH Comment – Cisco sits in Eastland County in West Central Texas. The area remains very rural and lightly populated. There were only 20 people per square mile living in the county according to the 2000 census. All that to say there is a lot of space and areas for wildlife. As for this account, due to the size reported, I cannot absolutely rule out a large feral cat. They can get surprisingly large when living in areas where food is plentiful and easy to come by. I feel that a jaguarundi is also a possibility here. The size fits though the description of the tail given by the witness would not be a perfect match. Neither can I rule out a juvenile cat of some larger species. It is just impossible to say. Again, what are we to make of these sighting reports? I just don’t believe everyone is lying or mistaken. I continue to believe there is a biological entity behind these “black panther” sightings. I'll leave you with the words of a reader who sent me a comment just today. "I've hunted the vast brush country of South Texas for well over 30 years. 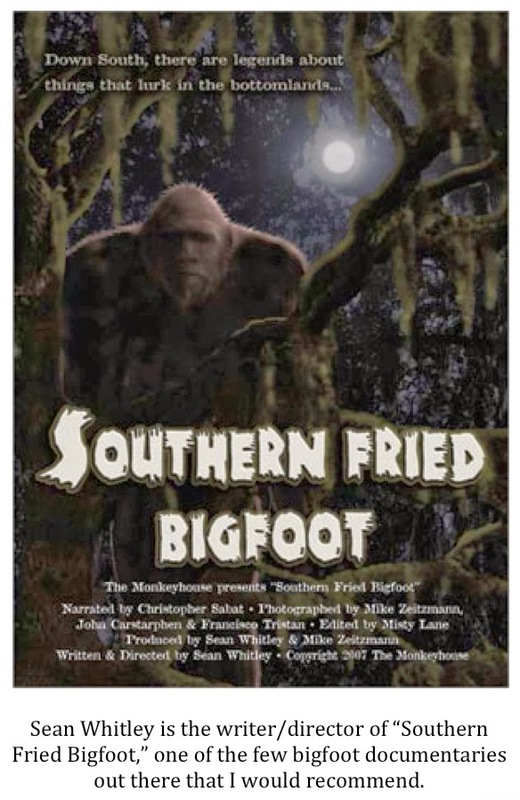 I've never seen a sasquatch, skunk ape, chupacabra or any other so called "cryptid." I've never seen a rattlesnake approaching 7 feet and I've never seen a wild hog much over 300 pounds. I don't watch "Finding Bigfoot" and I don't think there's a "Loch Ness monster". I don't think that little green men designed the pyramids and I don't believe in ghosts; I have, however, seen large "black cats" with my own eyes on several occasions." *Please continue to send in your sighting reports. If anyone has had multiple sightings on the same piece of property and is willing to allow me to post a game camera just let me know. Let’s get to the bottom of this mystery.